Helps to relieve headaches, reduce muscle tension, alleviate muscle knots and promote healing by targeting specific muscle groups. Remedial massage is also beneficial to those suffering from strains/sprains & tendonitis conditions. Remedial Massage combined with Postural Analysis will help to understand the causes and how to treat your chronic pain. When booking your appointment, make sure to mention the Heath Fund you belong to and we will allocate you to an appropriate therapist. A Swedish style massage incorporating long flowing techniques aimed at relaxing muscles, relieving stress, aches, pains and encouraging circulation. Healing Energy passes through the hands of the therapist to help relieve pain, shock and calm the mind and emotions. It loosens blocked energy and accelerates the body's natural ability to heal itself while promoting a state of total relaxation and well-being. For maximum vitality and health to bepresent,balance must be maintained between the chakras. Aura-soma combines the energies of herbs from essential oils and herbal extracts along with the energies of crystals and gems, to help balance body, mind and soul. This massage uses the energy balancing properties of heated stones to release tension and restore balance to mind, body and spirit. Hands in Harmony is proud to support the U10 Townsville Warriors Development Team: One of the few teams representing Townsville at State and National Levels. 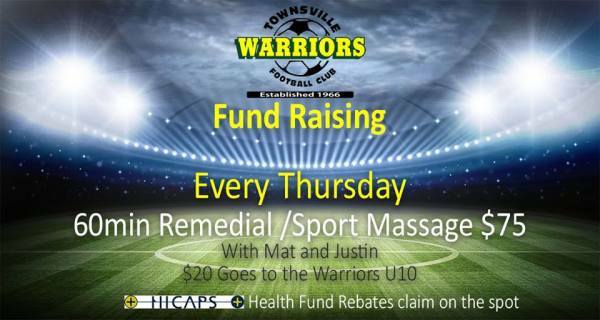 Every Thursday your can get your Remedial/Sport Massage at $75 instead of $90 with our Sport Massage Specialist: Mat and Justin. Hands in Harmony will give $20 to the Warriors for each and every booking.